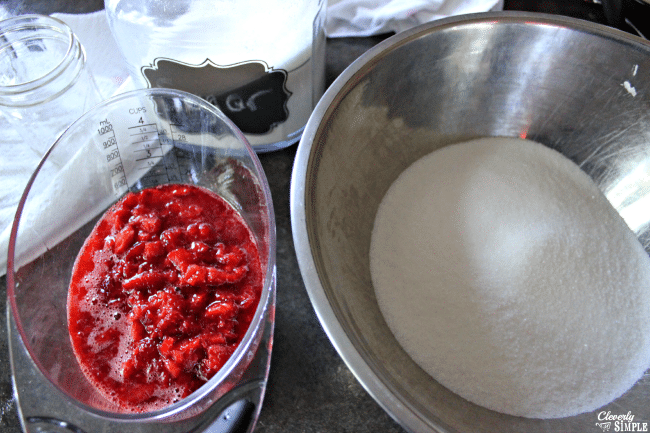 When it’s strawberry pickin’ time it is easy strawberry jam recipe time! My dad grows strawberries in his garden, and they are the most delicious strawberries of the entire year. But when they become ripe, they arrive quickly and you can’t eat them fast enough. Unlike the strawberries you’ll buy in the store, when you pick a ripe strawberry they will only last a few days. That’s when this easy strawberry jam recipe came into the picture. Even if you don’t have a garden, it’s easy to find strawberries at a farmer’s market or even in the grocery store. I do think the best flavor comes from fully ripe strawberries which are hard to come by in the grocery store. Fully ripe strawberries are red in the inside. If you bite into a store bought strawberry you will notice that they are white inside. I’m not really sure how they get the outside so red – but maybe I don’t want to know that. Either way, grab yourself 1 quart of strawberries! 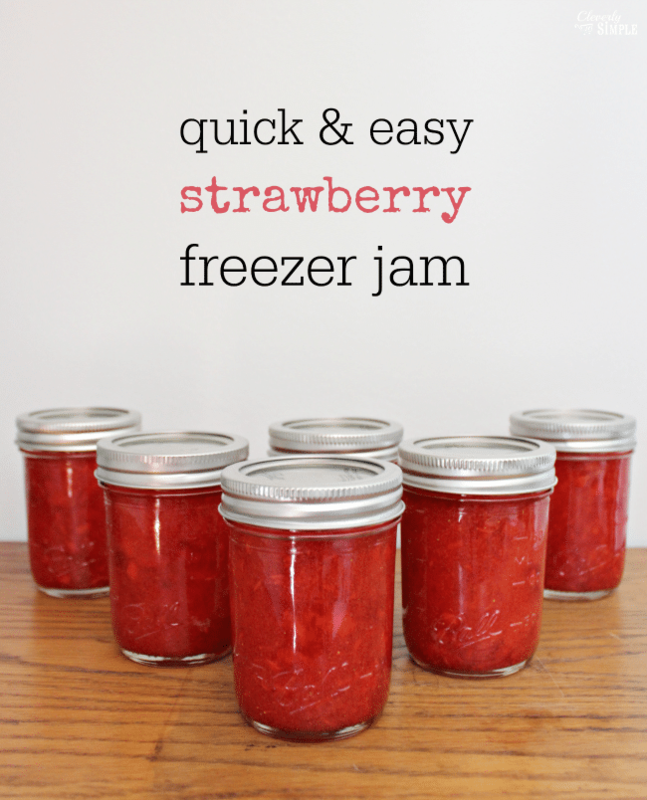 It takes 1 quart to make 6 (8 oz) jars of this easy strawberry jam recipe. Here’s what you’ll need to make Sure Jell freezer jam. There are other brands of pectin but I find that Sure Jell works great and so I stick with it and the recipe. You can find the exact same instructions (sans pictures) in the box. I’ve made this jam quite a few times over the years so I’m going to walk you through what I do. 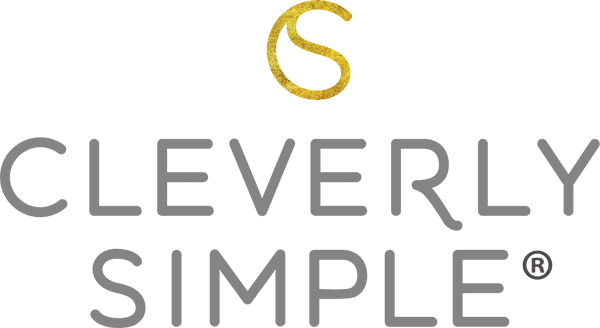 I think I’ve gotten more efficient in what I do so I hope it helps to simplify the process for you. I know that the first time I looked into the box of pectin with the chart with every kind of jelly listed I started to confuse myself. Hopefully, this will help you move quickly through the process and be on your way to being Laura Ingalls Wilder! So the first thing to do is to clean, clean clean. This is not the fun part. But keep in mind the jam you’re making will be so worth it. The first thing you’ll want to do is to clean your jars with soap and water. I don’t sterilize them in the oven when I’m making freezer jam. Since they’re not going to be stored at room temperature like canned tomatoes, I prefer to leave that step out. 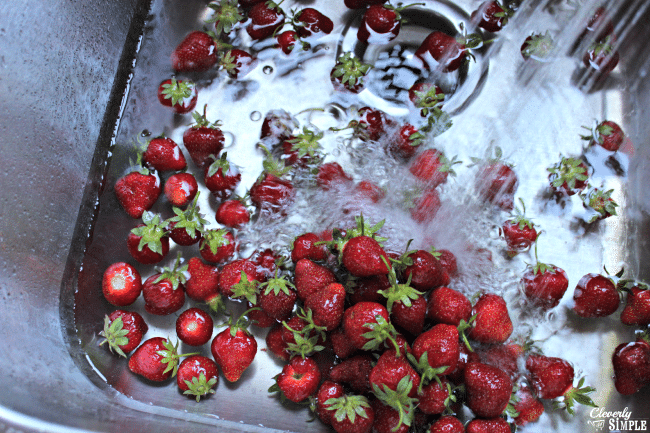 Once my jars are cleaned, rinsed and dried, I fill the sink with cold water and dunk my strawberries. I give them a bit of a swish. Since these are coming from the garden they were a bit dirty, so I always want to make sure the dirt is left in the sink and not in my jam. Once they are clean I cut off the tops and place them in a colander. I use this colander in my sink and love it for projects like this! Once I have all my strawberries de-headed, I put about one cup in a mixing bowl. Using a pastry blender I smash away. I have used a blender in the past and a blender that you pulse sparingly does work if you’re doing a big batch. I tend to like the pastry blender because it makes the jam a little chunkier which is my husband’s preference. After smashing the strawberries, I place them in a liquid measurer. I like to measure as I go as I’ll only need two total cups of crushed strawberries. It’s easy to measure them little by little. I also love these liquid measurers because I can see from eye level. With my two cups of crushed strawberries ready, I measure 4 cups of sugar in a separate bowl. It’s really important to measure your sugar correctly to have the exact amount when you’re canning. I use a dry cup measurer and then use a knife to level it. And then mix! It seems like four cups of sugar would be a lot (and well it is) but it blends well with the strawberries. It will be grainy. The next step doesn’t get a picture because it moves fast! 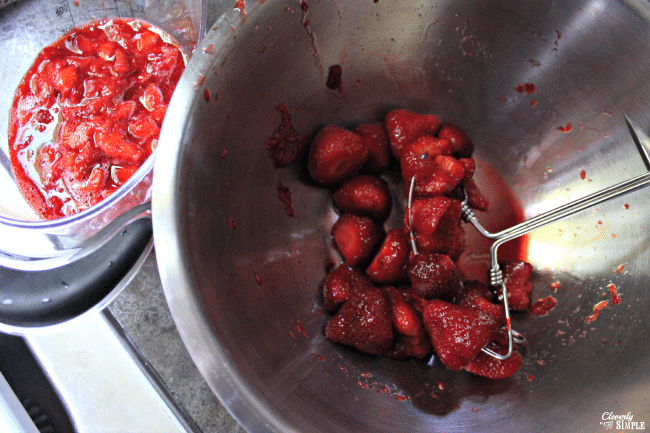 Once your strawberries are mixed you’re ready to prepare the pectin. 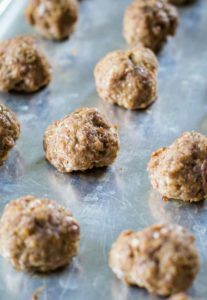 Add 3/4 cup water to a sauce pan and mix it with one box of Sure Jell pectin. (If you’re using a different pectin you will need to follow their directions.) Even though it’s lumpy after stirring, place the sauce pan on the stove on high. Stir until it comes to a boil. Boil for one minute stirring continually. You’ll notice that it looks a little more clear. 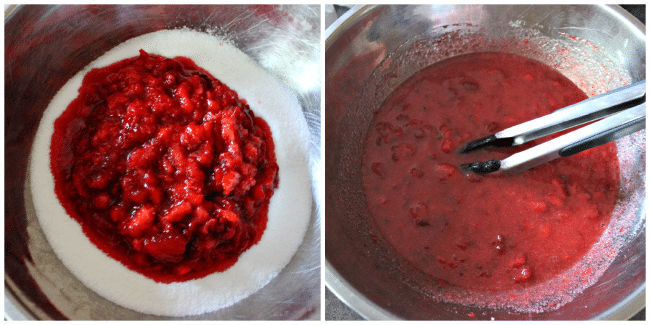 Once the pectin has boiled for one minute, take it off the stove and immediately add it to strawberry sugar mixture. Stir for three minutes continually. You’ll watch before your eyes as it becomes very smooth. There may still be a few sugar grains. Don’t worry. Fill the 8 oz jars carefully. You want to leave a 1/2 inch at the top to allow for expansion. I fill them to the point where the rim just starts. It’s perfect. If you have a canning funnel, use it. It will make life easier. I couldn’t find mine. Because of that I had to carefully wipe down all the rims to make sure there was no strawberry on them. This is the best! First time making it and my whole family ate it! They want me to make more!! 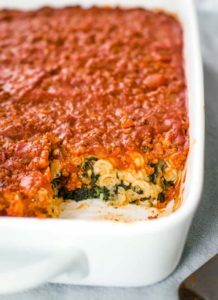 I left it a little chunky, I’ve tried many recipes but couldn’t quite get it. Thank you so much for sharing!!! 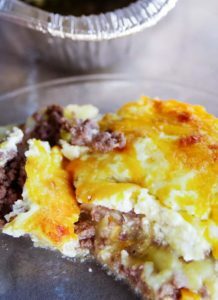 I will be making this again!! So glad you enjoyed it! We still love it each and every day at our home. 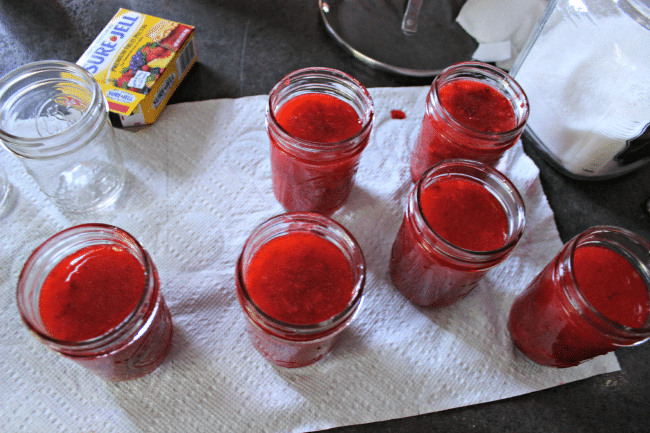 There’s nothing like homemade strawberry freezer jam! I made this. The recipe is excellent. It’s so easy. Thank you. 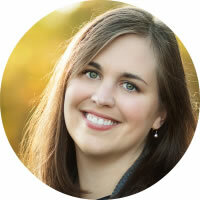 Hi Cheryle, so glad you enjoyed it! We have our freezer full this year and we’re going through it fast! 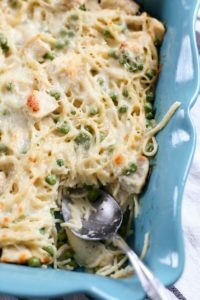 This is the recipe I’ve used for years. Very good and foolproof! Thank you for the recipe,it was easy, one question though. My jam set good but the jars didn’t seal, are they supposed to ,and if so is it still safe to put them in the freezer? If you were making a jam recipe that you would store on your pantry shelf, then you would need the seal. 🙂 . Hope you enjoy your jam!